The Goniopora spp. “daisy” or “flowerpot” corals have been common imports from Indonesia and other coral collecting regions since the early years of the reef-keeping hobby. Alveopora spp. are less-frequently harvested relatives of Goniopora spp. These distinct genera are often grouped together by aquarists because they have similarly elongate polyps with daisy-like heads. 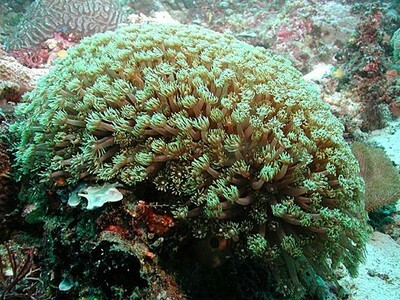 However, the petal-like tentacles in Goniopora number 24; in Alveopora there are just 12. These corals are among a small group of hermatypes that have both charmed and frustrated aquarists for years. I too have experienced the agony of failure with these corals but, more recently, have had quite reproducible and gratifying success with Alveopora, and several species of Goniopora. In my opinion, it is wrong to generalize that all “Goniopora” are difficult to keep. There are numerous species, and they behave differently in captivity. I reported (Sprung, 1999a, Sprung 1999b) that certain species of Goniopora are easy to keep, contrary to popular belief, and that most Alveopora are similarly hardy. Long-term success is reportedly rare in Goniopora stokesi, the most commonly harvested species for the aquarium trade, and the loss of the coral usually occurs slowly, as a sort of wasting condition. Some other Goniopora species are likewise difficult to maintain for apparently the same reason, but there are some species that do not usually suffer the same wasting condition. These “easy Gonioporas” are the ones with which I have had long-term success, in excess of five years. More recently I have been working on Goniopora stokesi. I believe I have discovered what it needs to prevent and cure the wasting condition, and why it occurs, but before I explain that, I want to review the state of opinion among aquarists concerning the genus. The aquarium literature concerning the difficulties with these corals as well as discussions among aquarists about them seem to focus on issues of water quality, light, and food. 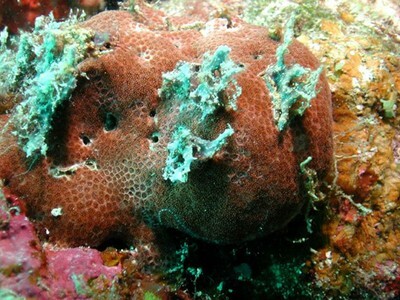 The accumulation of nitrate and phosphate, the maintenance of calcium and alkalinity in closed system aquariums, and a “missing magic ingredient” have been the focus of numerous “fishy” theories concerning the demise of these corals (see Ates, 1997, Wilkens, 1990, and Sprung and Delbeek, 1994). Additionally there was a study launched by Mary Middlebrook and apparently not yet completed regarding the possibility that Goniopora stokesi fared better when maintained in groups, with adjacent colonies in contact with each other. Subsequent to my publication of an article describing my ideas about coral bleaching and Goniopora stokesi (Sprung, 1999a), there were discussions on the internet and an articles published in response (Toonen, 1999a and Toonen, 2001) suggesting that Goniopora(again, in the general sense) required more food. 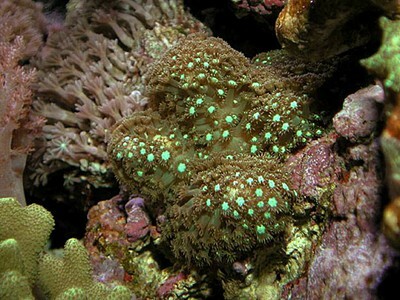 Many aquarists want to believe that the syndrome affecting Goniopora is really just starvation. I don’t believe it is. Nevertheless, Goniopora species do feed, and at least one study suggests the feeding is essential for their survival (Toonen 1999a and Toonen, 2001). Goniopora fruticosa photographed on a reef slope in the Solomon Islands. This is a distinctive species. Other species are more easily confused. Adding credence to the “missing ingredient” theories, a columnar Goniopora species maintained at the Waikiki Aquarium has thrived and grown enormously… for many years, under natural sunlight in an open-system aquarium using seawater supplied through a well. By contrast, when aquarists at the aquarium attempted to maintain cuttings of this species in a closed system with artificial light, they had the typical experience of a slow decline in polyp expansion. To prevent eventual loss of the colonies the fragments were returned to an outdoor open system. The successfully maintained colony in the open system is never fed, and since the water supply to the tank is taken from a well there is no plankton supplied either. This arrangement could be employed in a set-up to demonstrate that food is or is not a factor for this species of Goniopora. In the existing display the Goniopora sp. is maintained in a reef aquarium with live rock and a bottom substrate, soone cannot rule out the production of plankton from a developed meiofauna population within the aquarium, even though no plankton is added. One might draw a variety of conclusions about the difference between the aquaria at Waikiki, and it is really too easy to assume that the closed system aquarium became depleted of some essential trace element. Anecdotal observations such as these have existed for years, but no one so far has definitively offered a reproducible demonstration that Goniopora requires a particular element for survival in closed aquaria. Moreover, analysis of seawater in closed system aquariums shows that though some trace elements are depleted, many accumulate with time or are in excess in the artificial seawater medium. (Fosså and Nilsen, 1996, Shimek, 2002, Atkinson and Bingman, 1999). In (Sprung, 1999a) I stated my opinion that neither excess nor depletion of trace elements is a causative factor in the difficulty with G. stokesi. I now disagree with my earlier opinion. Analysis of the well-water source at Waikiki showed that it contains a variety of elements in excess of natural seawater values, due to dissolution of volcanic rock in the aquifer (Atkinson et al, 1995). Of particular interest to me are the levels of iron and manganese in this water, as I will shortly explain, after debunking some of the other myths associated with the demise of this coral. Clownfish may take Goniopora spp. as surrogate hosts. This does not harm the coral in most cases. 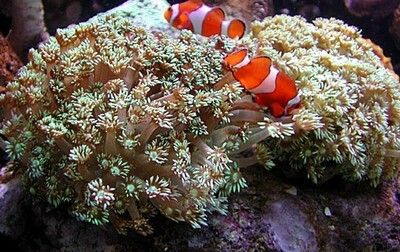 Some authors, noting that clownfish have a tendency to choose Goniopora polyps as a surrogate anemone, have suggested that the pestering presence of clownfish was a possible cause for Goniopora‘s demise in aquaria. In my opinion this is not so. I have heard the occasional report of clownfish literally ripping off polyps, but aside from such obviously destructive behavior, their mere swishing among the polyps is not the cause of the gradual decline seen in Goniopora, nor is it stressful to their surrogate host. One of my own Gonioporas that I purchased from the late aquarist/marinelife collector Eric Reichardt, lived for a couple of years in his aquarium with a trio of clownfish. I bought it and the clownfish when he had to tear his tank down. The Goniopora is now several years older, four times larger in skeleton and healthy as can be with its clownfish “pests.” The notion that clownfish housed with anemones might transfer damaginganemone mucus to the Goniopora is interesting to test, but certainly is not a factor in the common wasting syndrome typical of most Goniopora stokesi in captivity. Wilkens (1990) discussed nitrate and the green boring alga Ostreobium as causes for decline in the health of Goniopora. While it is true that the proliferation of boring algae in the skeleton can harm corals, aquarists are now more careful to maintain low nitrate levels via plenum or turf filter systems, even bringing nitrate down to the very low levels found on reefs. Despite this and in the absence of the telltale green stain on the skeleton that characterizes Ostreobium, Goniopora may still languish. Theories about elevated phosphate levels in closed systems harming Goniopora are also countered by the fact that aquarists who maintain low phosphate now by using protein skimming, R.O. water, Phosphate adsorbing filter media, and dosing kalkwasser still don’t see a dramatic increase in success with Goniopora stokesi. Newly imported specimens of Goniopora may suffer from the effect of air trapped in the skeleton (B. Carlson, pers comm), which may make them prone to infections. Goniopora spp. are prone to “brown jelly” (protozoan) infections (Wilkens, 1990), (Delbeek and Sprung, 1994). If these are not treated immediately the coral is wiped out in a very short period of time, normally one or two days. Another shipping stress related disease I have seen is caused by bacteria. 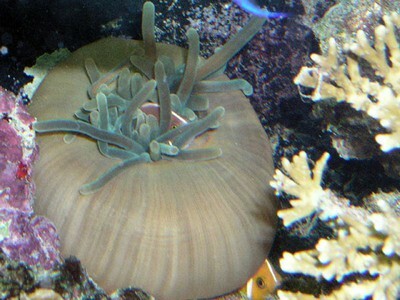 The symptoms include strong retraction of the polyps and development of a white film over portions of the colony, associated with necrosis of the polyps and tissue. Flushing away the white film reveals that this condition rapidly destroys the coral tissue, causing it to separate from the skeleton and literally disintegrate. The condition is often associated with a foul smell and sometimes hydrogen sulfide production from the core of the skeleton. In any case these causes of death are swift and not related tothe slow wasting condition. 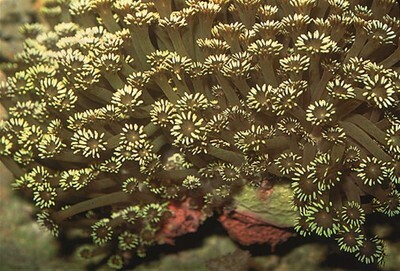 Goniopora columna has numerous color forms and is very similar to G. pandoraensis. Some aquarists believe that Goniopora stokesi simply needs more food in aquaria, that the symptoms of slow decline are really a sign of starvation (Toonen, 1999a and Toonen, 2001). This natural supposition does not make sense when coupled with a few other observations. First, the occasional specimen of Goniopora stokesi thrives and grows for years without supplemental feeding, in closed systems and in open systems. Other Goniopora spp. also thrive without supplemental food aside from what is offered to the fishes. The Goniopora sp. at Waikiki, for example, is in an open system fed plankton- free well water. If food were the only issue, surely specimens maintained in heavily fed aquariums would fare better than those maintained in sparsely fed aquariums. They apparently don’t. When Goniopora stokesi begins to decline it bleaches and becomes sensitive to light: bright light makes it bleach further and retract its tentacles (Sprung, 1999). The tentacles furthermore become stumpy and degenerate. Though the photosynthetically produced exudates from its symbiotic zooxanthellae is a source of food, the light harms the coral for reasons I’ll shortly explain, and thus it cannot obtain sufficient food from its symbionts. Gradual tissue recession results, partly due to starvation and partly due to what I believe is the principle problem, oxidative stress damage. This situation is a bit of a paradox: Starvation is not the cause of the problem, but Goniopora stokesi apparently do slowly starve to death in aquariums. 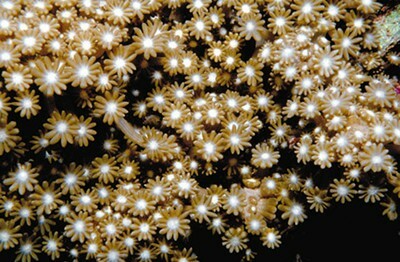 Improvements in lighting systems offered a possible frontier for solving the Goniopora mystery, but that frontier appears to have been crossed without solving the problem. Now that we aquarists have finally got a handle of how and why to maintain the alkalinity and calcium level, and now that we have very good quality light sources, reports of success with all corals, including the subjects of this article, have increased. But if “the problem” with Gonioporastokesi were just an issue of spectrum or intensity of the light, there wouldn’t still be a problem. Nevertheless, light plays a central role since, in my opinion, the problem is a bleaching syndrome (Sprung, 1999a, Sprung 2001). Goniopora pandoraensis forms upright branches in quiet lagoon reefs. It is among the easiest species to maintain. While bacteria can cause infections and tissue loss in corals, other bacteria on corals have been associated with bleaching alone or bleaching that leads to tissue loss. Rosenberg and Loya (1999) describes how bleaching in a species of Oculina is caused by a species of bacteria, Vibrio shiloi. In Sprung (1999) I stated my opinion that the slow wasting condition in Goniopora stokesi may be a disease caused by a specific pathogenic bacterium, as in the example of Oculina shiloi. While I still believe that such a pathogen may affect Goniopora spp. sometimes, I do not believe it is the principle factor in the slow wasting condition commonly observed in G. stokesi in captivity. I still believe the principle factor is a bleaching phenomenon, but I believe that it involves the system used to detoxify oxygen free radicals generated during photosynthesis. Before I elaborate on that I want to continue for a moment on the topic of bacteriainduced bleaching. A more recent study (Ben-Haim and Rosenberg, 2002) made the connection between the effect observed in the Mediterranean and one observed on tropical reefs in the common tropical Indo-Pacific coral Pocillopora damicornis collected from Zanzibar (see Delbeek, 2002 for some additional comments regarding this paper). The fact that bacteria have been associated with coral bleaching in some species of corals does not mean that bacteria are involved with bleaching symptoms in Goniopora. Anecdotal field observations, however, lead me to believe that at least sometimes bacteria may be involved. Borneman (2002) reports “random occasional bleaching” mixed with healthy colonies in deep water in Indonesia. Veron (1986) on page 248 shows photographs of such mixed bleached and unbleached Goniopora pandoraensis. Such patchy effects need to be examined to determine whether their cause is environmental or due to the effects of pathogens. The hypothesis must be tested. Grow this organism in pure culture. Inject the culture of this microorganism into a healthy host (one that is free of the same pathogen and apparently healthy) to determine if the symptoms are reproduced by such an inoculation. Recover the suspected microorganism from the experimentally infected host. This method is referred to in microbiology as applying Koch’s postulates and it is used to demonstrate the causative agent of a disease. A particularly beautiful Goniopora cf. somaliensis. The red form of this species has been a popular import from Indonesia the past few years. Some forms have green, others magenta oral cones. 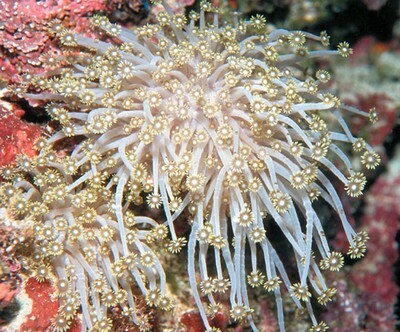 This Goniopora somaliensis maintained with strong currents developed acrospheres on the tentacle tips. An additional approach, which can be done in conjunction as a part of the study, is to determine if antibiotic treatment reverses the slow wasting condition. 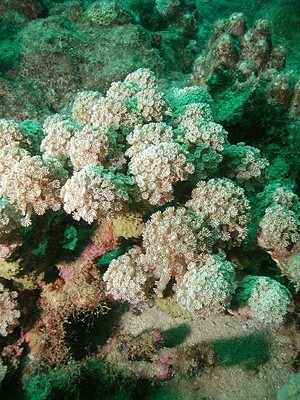 The authors of the papers on Oculina and Pocillopora were able to block the disease with specific antibiotics. Nevertheless, I suspect that the majority of incidences of slow wasting in Goniopora stokesi are not due to disease, but are instead related to an inability to detoxify oxygen free- radicals in the captive environment. The question is, why does this species almost always seem to bleach in captivity? Recently there has been an increased interest in supplementation with iron and, to a lesser extent, manganese in aquarium publications (Holmes-Farley, 2002a and b). While some of the interest surrounds the use of iron by plants in refugium filters, the benefit to zooxanthellae and corals is less studied but implied (Sprung 2002, Holmes-Farley 2002a). Holmes-Farley (2002b) offers a review of scientific literature concerning experiments with iron and corals, as well as studies of the iron content in corals. The literature concerning iron and corals is not voluminous, but for plants that is another story. Iron is essential for the synthesis of chlorophyll, for the release of energy from sugars and starches accomplished by light energy transferring compounds during photosynthesis, and it is a component of several important enzymes. These functions are crucial to corals that have symbiotic zooxanthellae. Manganese is a cofactor that is essential for chloroplast production and chlorphyll formation, and it also participates and assists iron in energy release from energy transferring molecules during photosynthesis. Manganese is also involved in the uptake of nitrogen. Manganese also activates important enzymes, and is involved with superoxide dismutase, an enzyme that detoxifies oxygen free-radicals. This indicates a connection to the zooxanthellae and bleaching, which is often a response to the over-production of oxygen free radicals (Warner, et al., 1999, Downs, et al, 2002). Different forms of superoxide dismutase have iron or manganese. There are other forms of superoxide dismutase with other metal ions associated with them, but only iron and manganese are likely to be limiting in closed aquariums (Shimek, 2002, Fosså and Nilsen, 1996). Goniopora minor photographed on a reef slope in the Solomon Islands. Goniopora somaliensis has numerous color forms, including this one. 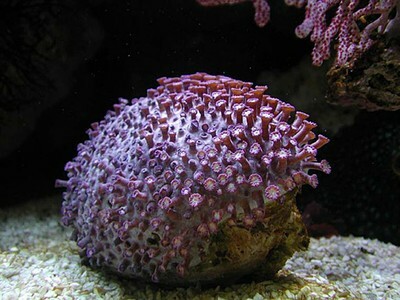 A purple Goniopora cf. tenuidens in one of the author’s aquariums. Newly imported Goniopora cf. tenuidens with poorly expanding polyps. The degenerated tentacles in this newly acquired purple Goniopora cf. 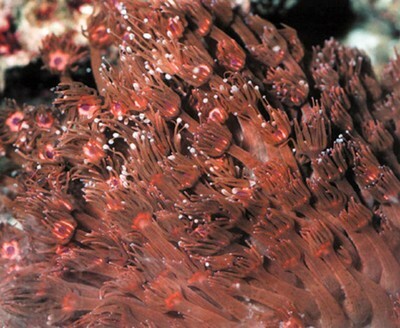 tenuidens make the polyps strongly resemble those of Blastomussa merleti. Supplementation with iron and manganese reverses this condition. One of the author’s favorite corals to observe in nature, Alveopora catalai lives on moderately deep reef slopes in lagoons. 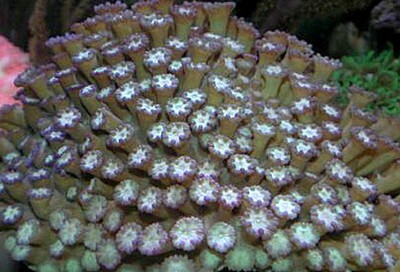 The polyps expand in the near motionless water. As is true in many endeavors, researchers in a field share interest in the same areas simultaneously. I too have been exploring the role of iron in zooxanthellae health, but I have taken the approach of including manganese “in the mix” since the two elements are known to work together to the benefit of plants. 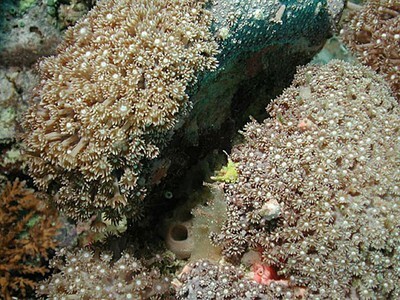 I have observed that an effect of supplementing these two elements is the reversal of bleaching in Corallimorpharia and large polyped corals such as various mussids and the genus Trachyphyllia. An additional effect of the iron and manganese supplement on Goniopora cf. tenuidens also is demonstrable. All imported specimens of a purple and blue variety of this species exhibit polyp contraction that soon leads to gradual tissue recession and polyp loss. I have observed dozens of specimens, all exhibiting the same condition from the moment they were received. Intrigued by this I wondered whether it might be possible to reverse the condition and keep one of these colorful Gonioporas. I bought one at a local shop in Miami and placed it in one of my aquariums, high up under metal halide light and in moderate water flow. It is my experience that members of the Poritidae that have strong purple or blue pigment tend to occur in bright light situations on the reef. The Goniopora cf. tenuidens remained closed for several days, but I noticed that the addition of a supplement I prepared that contains iron and manganese seemed to stimulatepolyp expansion in the coral within hours. When I discontinued the addition, after a few days the polyps remained contracted for days. When I added the supplement again they expanded within hours and stayed expanded for a few days. When I added the supplement regularly the polyps remained expanded and developed colorful tentacles. They have not contracted now for over six months, and the colony is growing. A red form of Goniopora stuchburyi in the Solomon Islands. This species has very small polyps. The anecdotal observation that iron and manganese seem to help alleviate bleaching symptoms in G. tenuidens, and the literature concerning detoxification of oxygen free-radicals suggests these elements are useful to the coral, but does not necessarily suggest that Goniopora stokesi has a special requirement for iron and manganese. That iron and manganese limitation or supply affects Goniopora stokesi. It prevents or reverses the slow wasting syndrome. My presentation at the upcoming IMAC 2003 conference in Chicago (see http://www.theimac.org/) will focus on the study I am conducting and will offer some additional details about the experimental design and new observations made by that time. Husbandry: Some Husbandry considerations for commonly imported Goniopora and Alveopora spp. I offer here some guidelines for the care of the most commonly imported varieties of Goniopora and Alveopora. My comments regarding feeding refer to the types of food that an aquarist typically might offer, such as brine shrimp, brine shrimp nauplii, copepods, or pulverized foods. In this article I am not taking into consideration the fact that the corals discussed may feed on invertebrate larvae produced within the tank or on phytoplankton (see Toonen, 1999, Toonen, 2001, and Sprung, 1999b). I know that these corals are feeding to supplement the photosynthetic products of their symbiotic zooxanthellae, but my comments here refer to the need to add supplemental food aside from the food offered to fishes housed in the aquarium. In Sprung (1999a) I described a set up I created initially as a refugium/Jaubert plenum filter system, which has turned out to be quite a nice place for growing branched Goniopora and Alveopora. For Alveopora and branchy Goniopora species (for example, G. pandoraensis, G. eclipsensis, and G. columna ) that look like Alveopora, moderate to relatively low light intensity and moderate to low water flow are best. In the low flow, diffuse light aquarium with shallow water I have been able to grow branchy Goniopora pandoraensis and Alveopora gigas for several years. They extend their daisy-like polyps beautifully. These corals simply would not survive in the typical “more-flow, more-light” systems in vogue today among reef keepers. I have not seen any of the above-mentioned species take food offered to them, whether live or particulate. Siegel (2002) suggests that success with Alveopora may require placement on the bottom substrate. While it is true that such a placement is generally good for many members of this genus, it is not the substrate itself that benefits the coral. Rather it is the less intense and less direct light, as well as lower water flow. I have maintained Alveopora spp. on the substrate and attached to rock, but always with indirect light and moderate to low water flow. Toonen (1999) discusses occasional success with Goniopora stokesi in refugium aquariums. 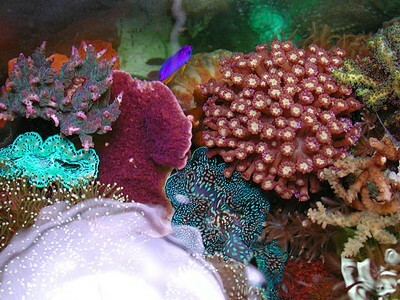 As such aquariums typically also include various algae, it may be that the aquarist is supplementing with iron and manganese for the algae and benefiting the coral, or that exudates from the algae are chelating the iron and manganese in the water and maintaining adequate levels for the coral. The algae also give off spores that the coral may feed on. This small species is popular with aquarists in Japan where it is readily available. 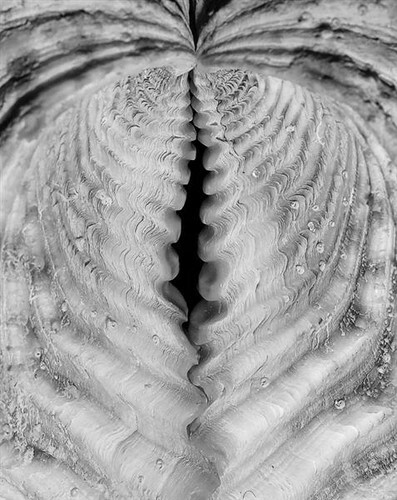 Colonies are typically small spheres, about one or two inches in diameter, but with the polyps extended these are about three or four inches across. They come in fantastic combinations of green, white, and gray. Alveopora japonica is a bit more sensitive to high temperatures than other Alveopora species. It should be maintained below 80 degrees F., with moderate to low light levels. It tolerates strong water motion but shows best in low to moderate flow. It should not be placed on the substrate because sand-shifting creatures may bury it. This species does not take food offered. This species is occasionally harvested in Indonesia for aquariums, mostly unintentionally, as small colonies attached to another organism. 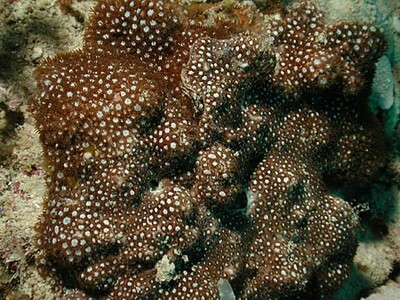 Goniopora fruticosa, has chocolate brown polyps with white oral cones. The polyps don’t extend quite as much as in other Goniopora spp. I saw this species in clear water on reef slopes in the Solomon Islands. Colonies are encrusting with numerous short upright branches, and may cover large surface areas. They were not on exposed reef fronts, but instead occurred on more protected slopes that are at about a 45 degree angle with respect to the surface. The currents were slight to moderate in this habitat. In captivity they tolerate a wide range of light intensity. This species does take small zooplankton. Goniopora lobata has elongate polyps, like G. stokesi. Alveopora gigas growing in one of the author’s aquariums. Note that the coral has grown to the water’s surface. The past few years a very beautiful bright red species, Goniopora cf. somaliensis has been imported from Indonesia with some regularity, and it is popular owing to the fact that it is among the hardiest species. It fares well both in low light low flow aquariums and bright light strong flow aquariums. With strong water flow and stronger light they develop longer, fatter polyps with stringy tentacles and acrospheres on the tips of the tentacles. This species does take small zooplankton. This species has been imported frequently in the past year. It is purple with bluish tentacle tips and pale cream colored oral cones. Gonioporatenuidens is known to have other color combinations, and the species I am discussing may in fact be another species, though it matches no other in Veron (2000). This species fares well under strong illumination and moderate water flow, but it appears to require supplementation with iron and manganese. I have not observed it taking any plankton. The care of this species is essentially the same as for G. lobata, G. minor, and G. djiboutiensis, which are similar in appearance. Goniopora stokesi occurs mainly in turbid lagoons in shallow water on coral rubble or soft substrates. It also occurs on reefs and in deep water. With its habitat preferences one might expect it to be very hardy. Nevertheless, it is considered delicate by most aquarists. Aquariums for keeping this species should consider the most common habitat: a horizontal substrate, with moderately strong light, though somewhat diffused by the turbidity in the water. The water flow is influenced by tidal currents, so it is periodically strong but more often slight. As I hypothesize in this article, the husbandry of this species may require extra attention to the supplementation of iron and manganese. I have seen Goniopora stokesi feed on live brine shrimp and other plankton, but I believe it can be maintained without extra feeding. Goniopora stokesi: The author believes that long-term wasting in this coral can be attributed to oxidative stress induced bleaching, and that it can be prevented with iron and manganese supplements that assist in the detoxification of oxygen free-radicals. This hypothesis is being tested. Atkinson, M. and C. Bingman. 1999. The Composition of Several Synthetic Seawater Mixes. March 1999 Aquarium Frontiers On-line. Ben-Haim, Y. and E. Rosenberg. 2002 A novel Vibrio sp. pathogen of the coral Pocilloporadamicornis. Marine Biology 141: 47-55. Borneman, 2002. Do You Know Where Your Corals Are Coming From? Ecological Information for Aquarists from Coral Collection Areas in Indonesia. Advanced Aquarists Online Magazine. Vol 1, Issue 3. Delbeek J.C. 2002. Media Review. Advanced Aquarists Online Magazine. Vol 1, Issue 8. Delbeek and Sprung, 1994. The Reef Aquarium Volume One. Ricordea Publishing, Coconut Grove, FL. Delbeek and Sprung, 1997. The Reef Aquarium Volume Two. Ricordea Publishing, Coconut Grove, FL. Fosså, S. and A. Nilsen (1996) The Modern Coral Reef Aquarium Volume 1. Birgit Schmettkamp Verlag. Holmes-Farley, R. 2002a. Iron in a Reef Tank. Advanced Aquarists Online Magazine. Vol 1, Issue 8. Holmes-Farley, R. 2002b. Iron A Look at Organisms other than Macroalgae. Advanced Aquarists Online Magazine. Vol 1, Issue 10. Rosenberg, E. and Y. Loya. 1999._ Vibrio Shiloi_ is the Etiological (Causative) Agent of Oculina Patagonica Bleaching: General Implications. Reef Encounter. Shimek, R. L. 2002. It’s (In) The Water. Reefkeeping.Com. Volume 1. Number 1. February, 2002. Siegel, T. 2002. Editorial. Advanced Aquarists Online Magazine. Vol 1, Issue 10. Sprung, J. 1999. Corals, A Quick Reference Guide. Ricordea Publishing, Coconut Grove, FL. Sprung, J. 1999a Is there really something special about Goniopora, Alveopora and Heliofungia?” Marine Fish and Reef USA . Sprung, J. 1999b_. Corals: A Quick Reference Guide_. Ricordea Publishing. Coconut Grove., FL. Sprung, J. 2002. Algae: A Problem Solver Guide. Ricordea Publishing, Coconut Grove, FL. Toren A., Laundau L., Kushmaro A, Loya Y, and E. Rosenberg (1998) Effect of Temperature on the adhesion of Vibrio AK-1 to Oculina patagonica and coral bleaching. Appl. Environ. Microbiol. 64: 1379 – 1384. Veron, J.E.N. 2000. Corals of The World. Vol 3. Australian Institute of Marine Science. Wilkens, P. 1990. Marine Invertebrates. Stone, False Corals, Colonial Anemones. Dahne Verlag, Ettlingen, Germany.